Want to support outdoor learning in Durham and enjoy the bounty of our garden each season? 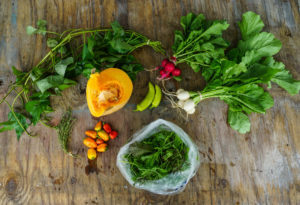 Every spring, summer, and fall season we offer an 8-week CSA membership so that YOU, our supporters, can receive regular bags of fresh, delicious produce from youth at the Hub Farm. Not only will you be eating fresh vegetables grown by DPS students, but your membership also supports vocational experiences for Northern High School interns. Your contribution is a tax-deductible donation. All proceeds go directly towards supporting, promoting and growing healthy food for students and our community. Interested in signing up? Email hannah@thehubfarm.org to receive more information, along with details on the next upcoming membership. We will offer 12 memberships, and will increase our CSA capacity each season. Payment and Pick-Up Details: Payment is a donation to Friends of the Hub Farm and is taken in full before the membership begins. 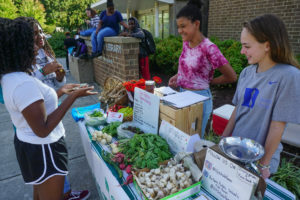 During our three growing seasons, Hub Farm high school interns run a farm stand in front of the North Regional Library. The farm stand is generally open from 4-6pm on Tuesday afternoons, but details vary by season- so stay tuned to our social media and email newsletter for the latest dates/hours each season! Thank you for supporting outdoor education in Durham and eating local! We couldn’t do it without you!